With its rustic design, LOG brings real cottage feeling into your home. 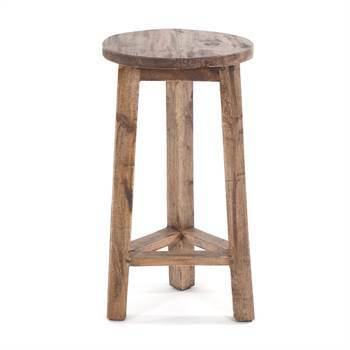 The stool is lovingly handmade out of recycled wood, so that each piece is unique. The natural wood has bumps and variations in colour, which underlines the incomparable used look of this beautiful piece of furniture. Thanks to its compact dimensions, our stool LOG really fits into every corner. The stool can be used as an additional seating opportunity, a flower stool, side table or for other decorative purposes. Equipped with a plant, a beautiful decoration or a candle, LOG becomes a real eye-catcher in every room and spreads a warm and comfortable feeling. LOG can be perfectly combined with other furniture from the recycling series, which you can also get from us. Measurements (app. ): Height: 20", Ø seating: 10.5", Width bottom: 10", Depth bottom: 10"
Rustic wooden stool with many purposes of use and for decorations. This stool was handcrafted in an Indonesian factory. With the purchase you support their work.